This is a version of the ICBM Average Brain – an average of 152 T1-weighted MRI scans, linearly and non-linearly (6 iterations) transformed to form a symmetric model in Talairach space – that is specially adapted for use with the MNI Linear Registration Package (mni_autoreg). 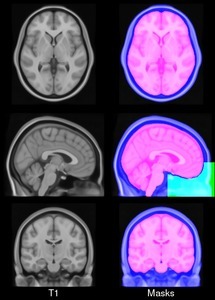 Copyright (C) 1993–2009 Louis Collins, McConnell Brain Imaging Centre, Montreal Neurological Institute, McGill University. Permission to use, copy, modify, and distribute this software and its documentation for any purpose and without fee is hereby granted, provided that the above copyright notice appear in all copies. The authors and McGill University make no representations about the suitability of this software for any purpose. It is provided “as is” without express or implied warranty. The authors are not responsible for any data loss, equipment damage, property loss, or injury to subjects or patients resulting from the use or misuse of this software package.